Jaeger has now been in San Francisco since the beginning of February. For the most part, I have been in Colorado. My prior schedule ended up being a bit optimistic. With job hunting, house selling, and figuring out San Francisco, my evenings have been overflowing. Most nights I pretend listening to an audio book as I drift off to sleep counts as “me time.” However, this is ok. It’s only temporary. At the end of February Calvin and I took a “preview” trip to San Francisco. Jaeger’s mom watched Julian while we were gone. The original plan was to use one day for rental hunting and the other day to convince Calvin that San Francisco would be a fun place to live. However, Ted was able to find a rental ahead of time. Instead, I spent most of one day measuring the rental for my SketchUp model while Jaeger entertained Calvin. Then, on Sunday, we visited Alcatraz and the Exploratorium. Coincidentally, the major user conference for our ILS was in San Francisco this year. I abandoned the kids back in Colorado to Jaeger’s mom and stayed with Jaeger during the conference. Back in the fall I had volunteered to present two presentations. At the time, it had seemed like a good idea. However, with everything else going on in our lives it was a challenge to find time to properly prepare. I finished the prep for my last presentation on the flight to SF. The conference turned out really good. In addition, I enjoyed spending time alone with Jaeger, the first since Julian was born. After the conference Jaeger flew home with me and we immediately left for a spring break ski vacation near Breckenridge. Originally, my work thought they could continue to employee me once I moved to San Francisco. However, after more research, they realized I would be considered a California employee which would have awkward tax complications. So, I’ve been job hunting. Wednesday, during the ski vacation, I was invited to interview the following Monday. Jaeger and I made some quick flight adjustments so he could stay with the kids while I went back to California. The interview went very well. It was very strange having our rental house to myself. The last time I was by myself was at the Computers in Libraries conference back in 2012. (Which, now that I think about it, was the last time we were selling our house.) It was really lovely being by myself and it sounds like Jaeger survived and did a fantastic job with the kids. As soon as I got back home it was time to get the house ready to sell. This last weekend our house went on the market. At our realtor’s suggestion I rented an Airbnb place for the weekend so we wouldn’t have to constantly be leaving the house for showings. This turned out to be excellent advice because we had 25 showings Friday-Saturday with an additional 3 showings first thing Monday morning. Offers were due to our realtor by noon on Monday and we received good ones. We picked our two favorites and now are under contract with a backup if the first one falls through. As our realtor was leaving, after discussing the offers, she told me, “now the hard part is over and you can sit back and relax.” Unfortunately, getting ready for the house showing meant I neglected many other things so now I’m desperately trying to catch-up before something else shows up that needs attention. Jaeger is coming for a visit this weekend. I’m hoping to get some quality relaxing time tomorrow, in between taking care of Julian, before starting to mark off items from my to-do list. It’ll be interesting to see what next week brings. This entry was posted in Updates on April 15, 2016 by kiesa. Last fall we decided Julian wasn’t providing nearly enough excitement in our lives. Obviously, we needed to up the difficulty level. To accomplish this, Jaeger took Calvin to India for Christmas while Julian, our au pair, and I visited my mother in Washington state. Jaeger came home for a week1 and then left this week for China, this time by himself, leaving me responsible for both Julian and Calvin. After China, Jaeger will be home for another week before moving to San Francisco for his new job. I will be staying in Colorado with the kids, and our au pair, until the school year has finished. Though, I do have two trips scheduled to visit Jaeger in San Francisco2. After Calvin and Jaeger left for India I worked for an additional week before flying to Washington. During that week I got a chance to try being a single parent with just one child. We do have an au pair but she works 8 hours a day taking care of Julian while I work for pay. Personally,I think 8 hours providing childcare is more than enough for anyone to have to deal with so only rarely do I use her as a recreational babysitter. Julian and I survived and the experience turned out reasonably well. Then we went to visit my mom. Our au pair came with us but I didn’t work most days and took primary care of Julian. Then, Julian and I flew back to Colorado while our au pair took an official week of vacation. This meant that I was Julian’s exclusive caregiver for essentially two weeks. That, combined with Julian getting sick, made him especially clingy which toward the end was starting to make me feel claustrophobic3. However, we survived. The first work day our au pair was back Julian spent most of the day screaming, I work in my bedroom so I could hear it all. However, by the second day he had resigned himself to letting the au pair take care of him again. Being back at work was wonderful and allowed me to have more patience to deal with Julian the rest of the time. I’m really amazed by women who can spend all day, every day, with their children, and not go insane. I’m a good mom but I would not make a good stay-at-home mom. It’s not my gift. On Tuesday Jaeger left for China. I’ve been using this time to prototype strategies for taking care of the kids by myself for the next 4 months. We’re only a couple of days in, and haven’t survived a weekend yet, but so far I think things are going pretty well. * 6:00-6:30 – Julian wakes up. Sometimes Julian tries to wake up before 6:00 but I really resist and refuse to turn on the lights. Depending on when he last ate, I may feed him. * 6:30-7:00 – I wake up Calvin and then shower. Julian comes with me into the bathroom which is mostly baby-proofed if the closet door is closed. Julian amuses himself by playing with the bath toys on the bathroom floor. One of Julian’s favorite games is to drop a toy into the bathtub and see how long it takes me to pick it up and give it back to him. * 7:00-7:30 – Calvin gets the choice every morning of granola, oatmeal, or fruit toast. He finds this boring but they’re all easy for me to make so he’s out of luck. Usually he picks fruit toast. I make the fruit toast and pack Calvin’s lunch while Julian crawls around on the kitchen floor trying to open the baby-proofed cupboards. * 7:30 – Our au pair comes on duty. This is where I cheat as a “single parent”. She takes Julian, who is often ready for a bottle, or depending when he actually woke up, a nap, and leaves me free to quickly clean up breakfast and make sure Calvin is basically ready to leave for school. Calvin is allowed to watch TV before breakfast, once he has his school close on, or after breakfast once he’s brushed his teeth. This is his only TV on a school day. * 7:40 – I take Calvin to school. We aim to leave at 7:40 but depending on how grumpy he is it may take longer to get out of the house4. Fortunately, his school is only 5 minutes away. * 8:00 – I come back and start work. I usually try to start the work day walking on the treadmill as it’s very easy to triage email and catch-up on everything while walking. I find it a little harder to do thinking tasks while walking, not sure why. I think meetings would be great treadmill time except the treadmill is loud enough it’s distracting for everyone else. I also have to make sure Julian isn’t downstairs while I’m walking because he’ll get upset and want me to take care of him instead of our au pair. In any case, I try to work for an hour or two on the treadmill as this is often my only exercise of the day. 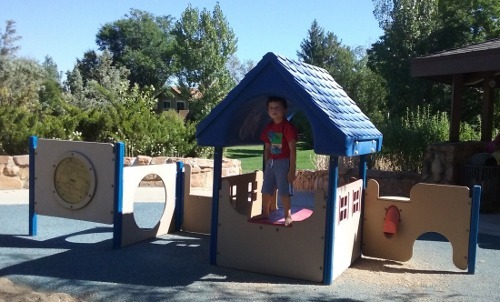 * 2:30 – I quit work and drive to pick up Calvin, leaving Julian with the au pair. I usually get to school 15 minutes before school ends and relax in the car reading a fiction book for a few minutes before picking him up. * 3:00 I usually walk into the school to pick Calvin up, instead of using car line, because I seem to learn more about his day that way. Often I’ll find Calvin is writing, reading, or drawing and I will wait 5-10 minutes to allow him to finish up his project. Depending on how busy his teacher is I sometimes get to exchange a few words with her while I wait. * 3:00-4:00 – This varies depending on the day. Toward the beginning of the week Calvin and I will do a quick produce run to the grocery store before going home5. On Fridays I usually pick Julian up and then we head off to the library to return books and pick up new ones. * 4:00 – Calvin works on his homework. I start cooking supper, roughly following the menu for the week. * 5:00 – My goal is to start eating supper around 5:00. This provides time to clean up before Julian has to go to bed. * 5:30 – We’re currently taking a short break from solid food while Julian’s stomach gets back to normal. However, assuming he has solid food for supper, as soon as supper is over I take him up for his bath. I usually can read a couple of paragraphs while Julian baths. Right now I’m using the time to read house staging books. * 6:00 – Bath time is over and we go back downstairs where I clean up the kitchen. Usually Julian is in a pretty decent mood at this point and Calvin will often play with Julian which both seem to find amusing. * 6:30 – I feed Julian a bottle and put him to bed. * 6:45 – I tidy up as much of the house as I can get to. * 7:00 – I read to Calvin. * 7:30 – Calvin goes to bed and I finish tidying up the house. * 8:00 – I often will watch a half hour of TV. While taking care of Julian over Christmas I discovered that I cannot use this time to read fiction. It’s too easy to keep reading way past when I need to go to bed. TV provides some entertainment for the day without hooking me enough that I go drastically past bedtime. At the moment I’m watching The Expanse in half hour spurts, which is not how it’s designed to be watched. I’d really like to find a light-hearted, yet non-stupid, sitcom I could stream but nothing I’ve run across recently has inspired me. * 8:30 – I go upstairs and read a non-fiction book. So far, it seems that non-fiction is sufficiently soothing without being engaging enough I’m tempted to stay up past my bedtime. * 9:00 – I turn on my audiobook for the night and go to sleep. The audiobook is usually by Bujold or Pratchett and is something I’ve listened to many times before. It stops my brain from obsessing about whatever my brain wants to obsess about and lets me fall asleep and go back to sleep after dealing with Julian’s nighttime wakings. * The rest of the night – Julian still isn’t sleeping through the night. Before Christmas he was down to once a night but since he was sick he’s currently at around 3 times a night. I’m hoping he’ll go back to just once a night soon. So far so good. I’m not sure how the weekend will go yet. What I’m really scared of is when we start trying to sell the house. While I’m trying to work lots of small tidying times into my schedule I’m afraid it’s not going to be enough to keep the house ready for showing. I suspect I’m just going to have to get up a little earlier in the day and probably sacrifice my evening time. Hopefully we can go under contract fairly quickly so I won’t have to keep up the intensive cleaning for too long. 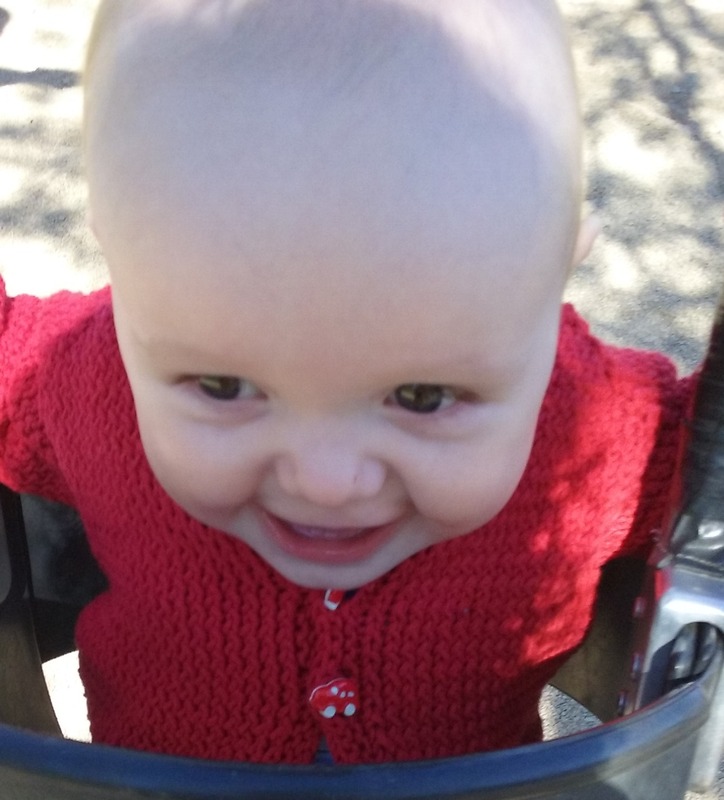 This entry was posted in Parenting on January 15, 2016 by kiesa. Tantra Park was the first park we visited last Sunday. Based on the map I knew the park was tucked away behind the houses but the park sprawls in an odd shape and I wasn’t sure where the playground structure was located. I looked at the satellite image and misidentified a catch basin as the likely spot. We parked by the tennis courts on W Moorhead Cir and crossed the street to enter via a path. 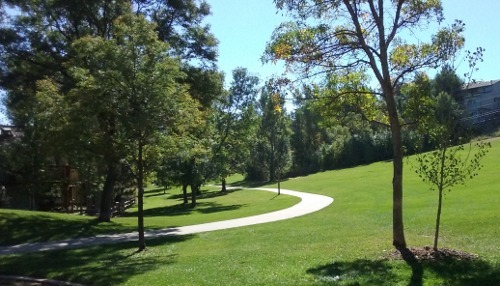 The path curves behind the subdivision houses and marks the beginning of a dramatic elevation increase. As we walked along the path in search of the playground I saw a sign strongly advising against sledding down the hill because it was steep with no flat area to slow down before you hit hard objects. Of course, now that I’m back with internet, I see that Tantra is a very popular sledding hill in winter. Who knew?1 According to Boulder Families the hill can get quite packed. This site gives you a feel for how it looks in winter. While I can see how some parts of the hill may be too steep I think there are probably other sections that are fine. 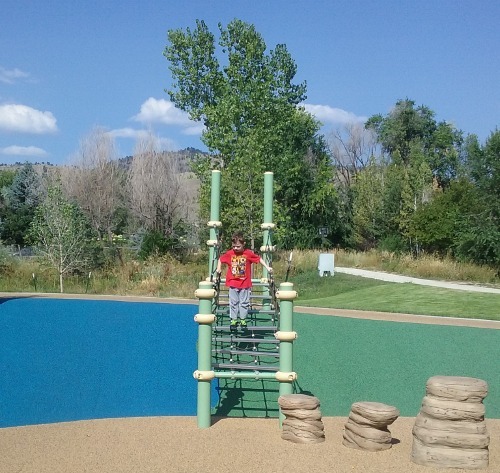 After meandering along the path we found the playground structure backing up to the east curve of Tantra Park Circle. However, I’m not sure there is a way from the street to get behind the houses. Possibly the tennis courts are as good a place to park as any. 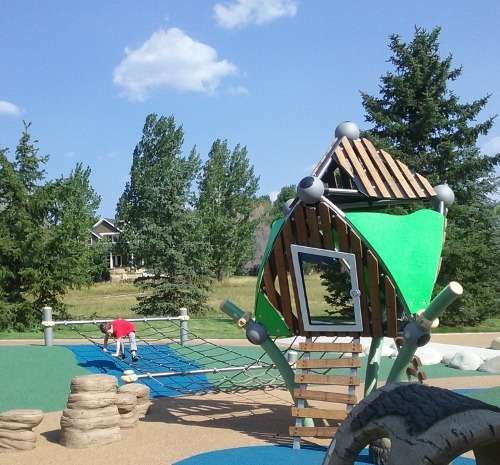 The playground structures are pretty good for such a hidden park. They have equipment for ages 5-122. 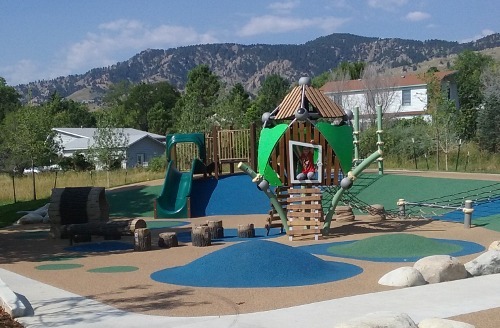 Overlooking the 5-12 play area is another area designed for younger kids that includes a play house and bucket swings. 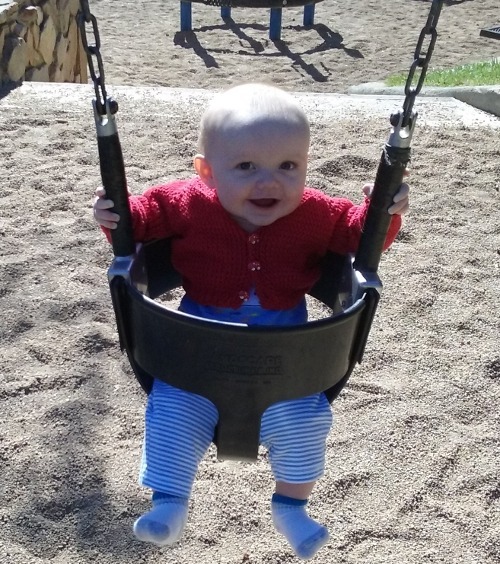 I decided it was time to see what Julian thinks of swings: he approves. 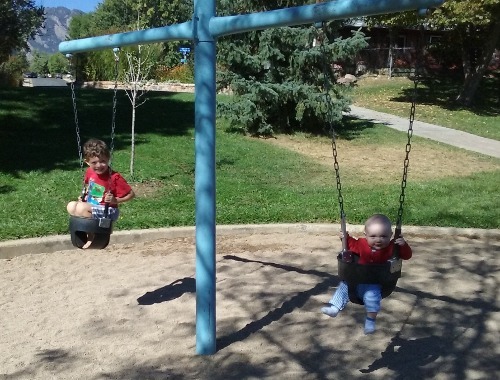 Calvin was excited that Julian is finally doing something he can relate to and joined us on the swings. If you look really (really) closely you can see Julian’s two brand-new teeth, discovered the prior day. 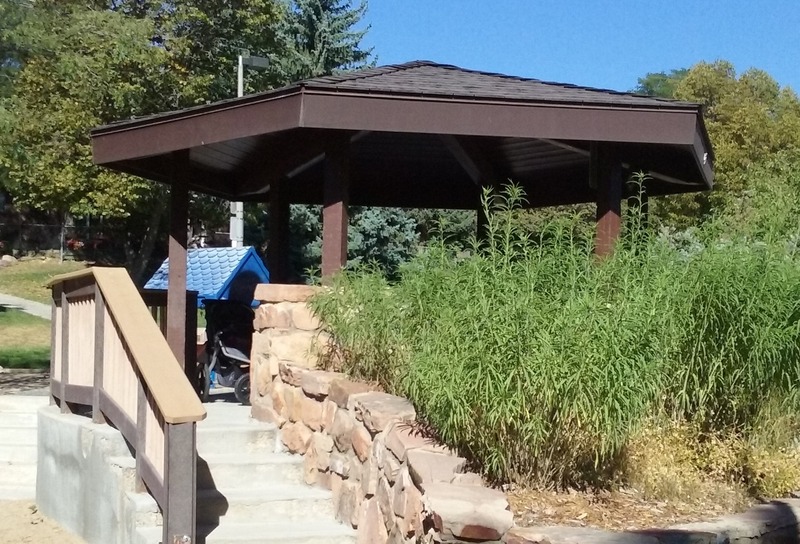 Beside the younger kid play area there is a covered structure with a picnic table. 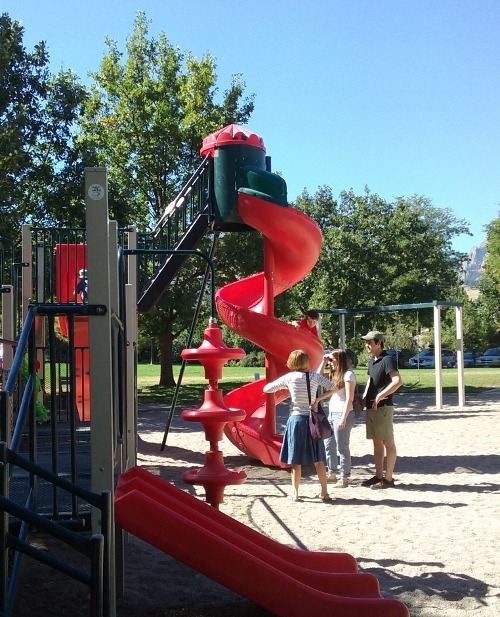 The picture shows steps from the 5-12 age play area but there is a path curved around the back that allows access to strollers and other wheeled contraptions. Calvin played briefly with some kids but didn’t spend a lot of time on the larger structure. Instead, he wanted to show off for Julian. 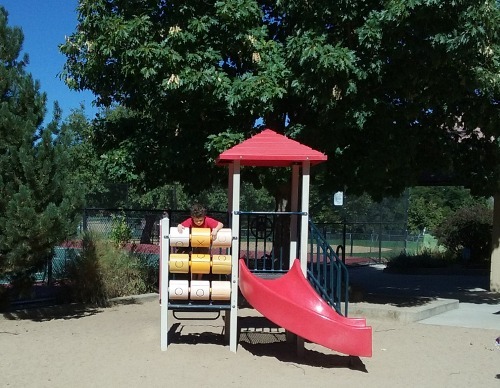 The playground equipment was mostly fairly traditional with the exception of . . . something I can’t find the name for. 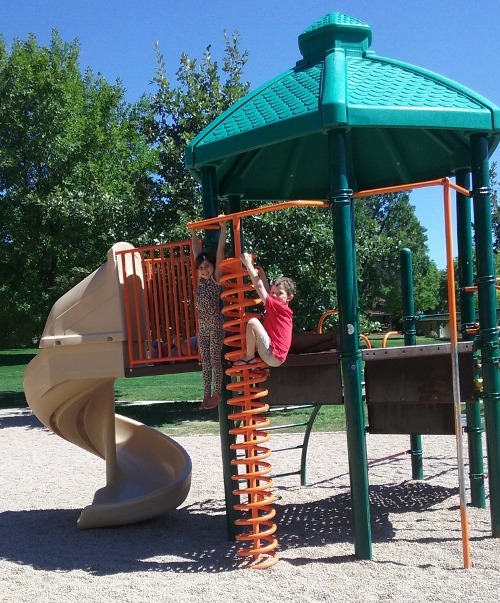 Basically it’s a raised flexible tube, with springs in the middle, that kids can jump on while hanging on to poles. It looks pedestrian when only one kid is on it but if you get multiple kids it can get quite bouncy. 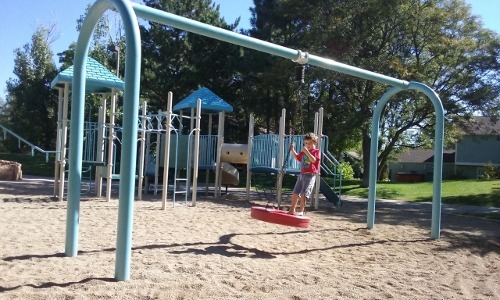 Both Calvin and Julian had lots of fun at this playground and if we’re around for winter we’ll need to come back and see if we can do some safe tobogganing. Picnic area Yes, one in covered shelter. Parking Street parking – Parking across from the tennis courts on W Moorhead Cir about as good a chance as any. Very long hike if you need a restroom in a hurry. Not for those being potty trained. 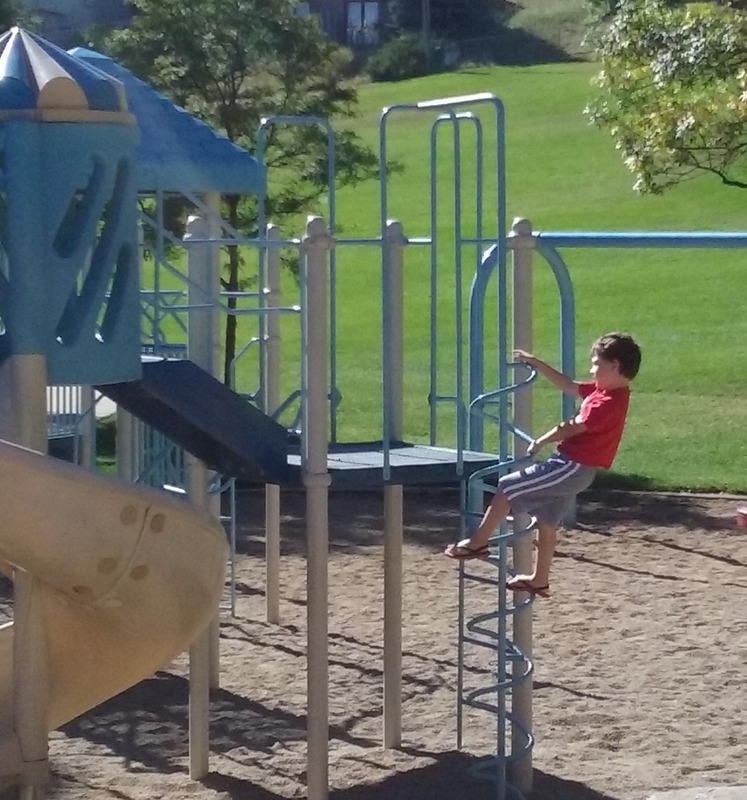 This entry was posted in Calvin, Julian, Parenting, Parks and Playgrounds on October 3, 2015 by kiesa. 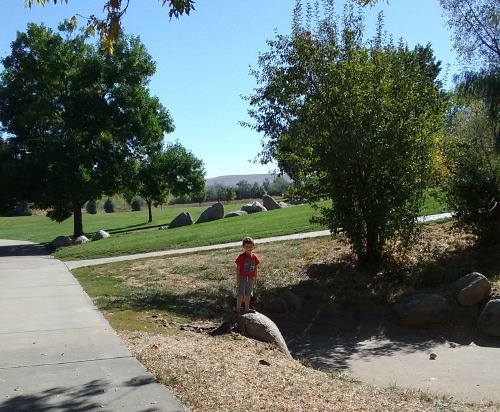 We went to two parks on Saturday: Tantra Park and Martin Park . I’m starting with Martin Park because it was a much shorter trip. Calvin seemed to get an attack of self-consciousness when he learned there was a birthday party happening and didn’t want to be around the other kids. 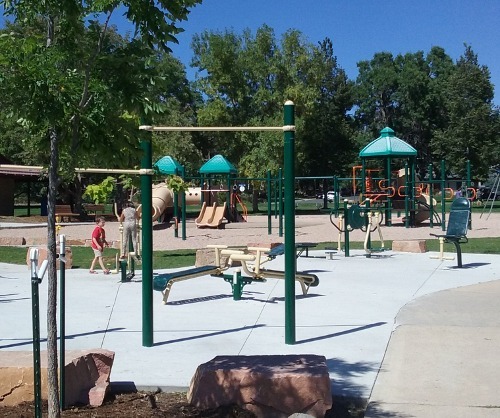 Martin Park is a neighborhood park but it has a wide variety of amenities including tennis courts, ball fields, a good size shelter, and of course a playground. 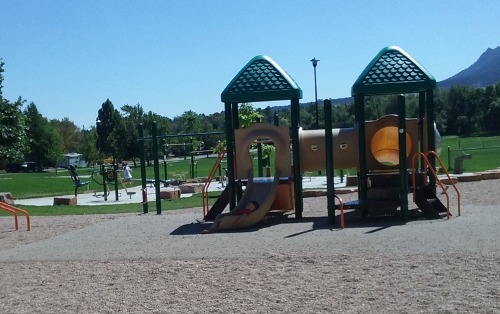 The playground has equipment for both younger and older kids. The bigger equipment has several different types of slides as well as a bridge. The little equipment has a slide and a tic-tac-toe panel. Bear Creek runs alongside the park. The side of the park next to the creek has a fence (with openings) presumably to make it harder for children to bolt the moment their guardian looks away. Overall, even though our visit was very brief it seemed like a nice park. Picnic area Yes, covered shelter with several picnic tables. 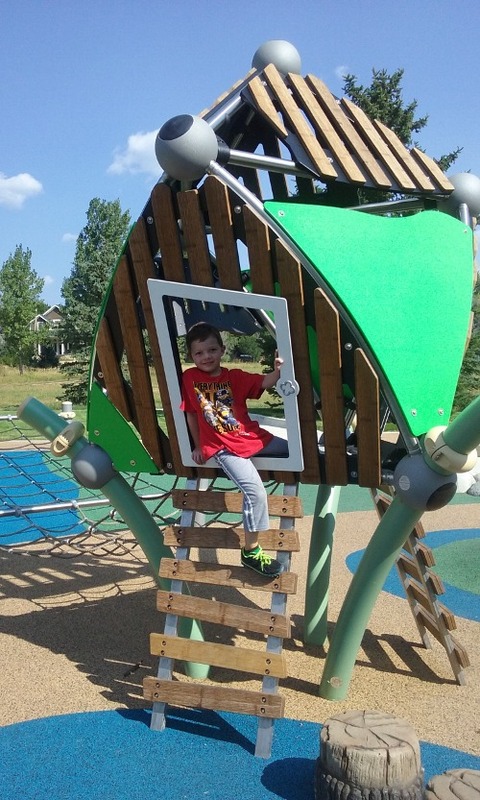 This entry was posted in Parks and Playgrounds on September 28, 2015 by kiesa. 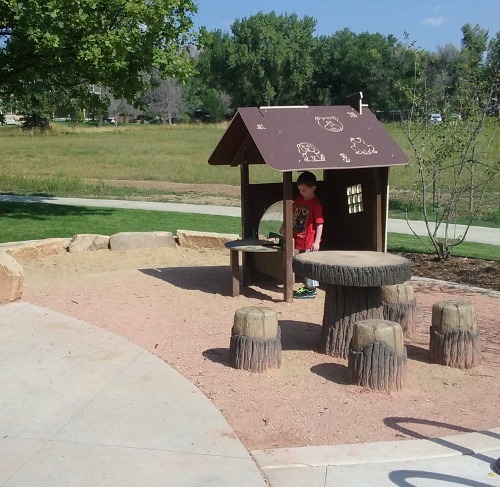 Several years ago we visited North Boulder Park. There was a lot of construction fencing around the park and I kept meaning to go back and see what had been done. Finally, last Saturday, we visited the park again. It turns out they added an adult exercise area. 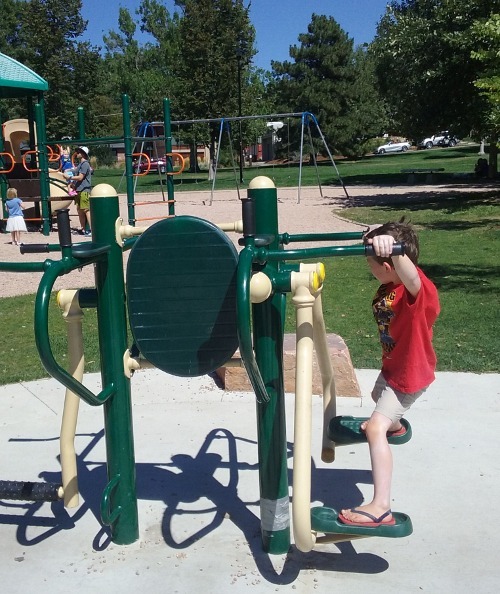 The exercise equipment was very popular with the kids. It is intended for ages 14+ and younger kids could get hurt if not watched carefully. No adults used it while we were there. However, that probably was because it was quite hot. 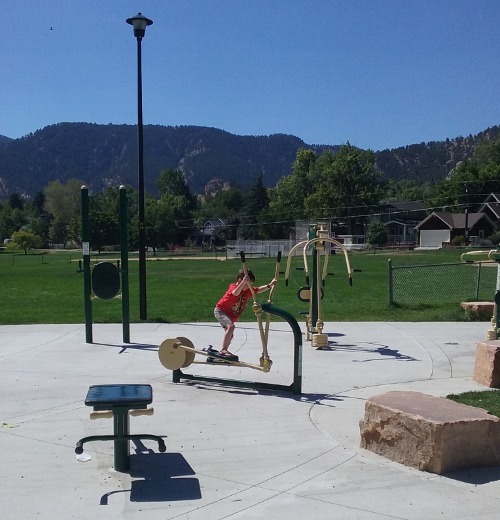 The adult exercise equipment provides a pretty good view of the children’s playground equipment so, depending on the age and needs of your child, it might be possible to exercise while your kids play. Naturally, since this is suppose to be adult equipment it was over-sized for all the kids. The children’s equipment was traditional but in good repair. It had an area for older kids and younger kids. Calvin spent a lot of time in a lovely tree. 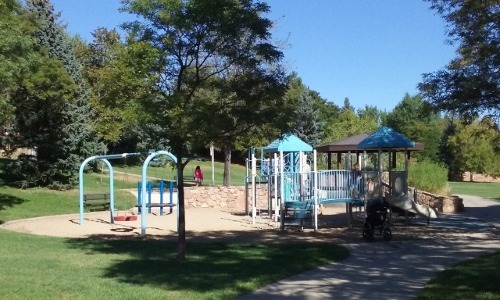 Aside from the playground, the park has a wide variety of activities. There’s a very large field next to the playground which is very popular as a cross country skiing venue in the winter. There’s also a fairly large shelter. It’s right next to the playground equipment but you can’t be under the shelter and see the playground at the same time. However, there are various benches shaded by trees scattered around the equipment area. There’s also a half-court basketball court and table tennis. Shade Shade trees and large shelter. A lot of shaded benches but very little shade on the actual playground. Picnic area Yes, covered shelter with several picnic tables. Also have a couple of picnic tables that aren’t covered as well as 2 grills. 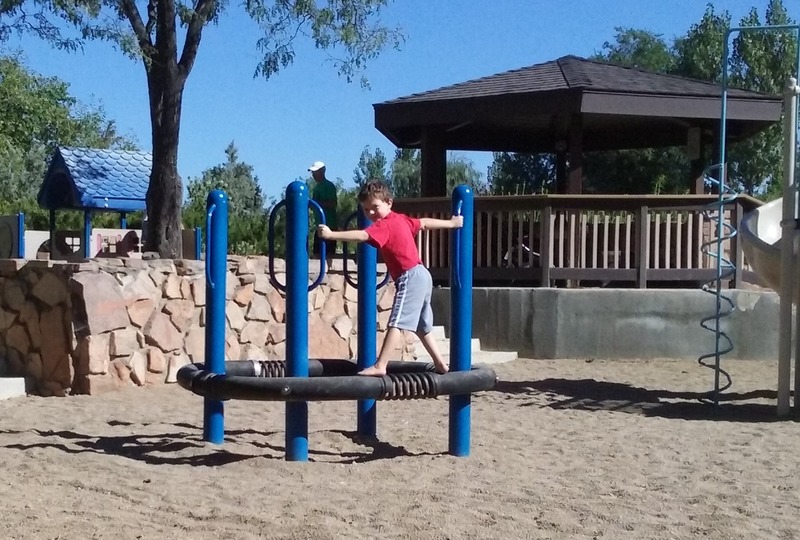 Very traditional playground equipment, not very challenging for older kids. 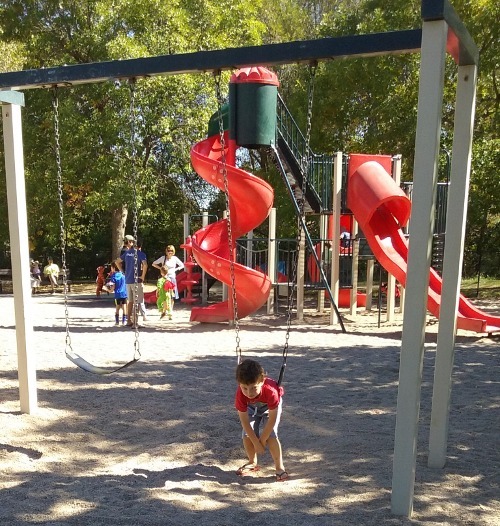 This entry was posted in Calvin, Parks and Playgrounds on September 19, 2015 by kiesa. I was looking at my recent blog entries and noticed that, other than our feeding drama, I haven’t talked about life with a second child. I don’t have postpartum depression this time. This makes a huge difference in all aspects of my life and how I relate to my children. I can’t even begin to describe the difference. I spent the first month after Julian was born thinking he was an easy baby. We had feeding issues but I wasn’t as obsessed with feeding Julian The One True Way and so was able to focus on nutrition over dogma. Having lived with Julian for four months I now believe that Julian isn’t what most people would consider an easy baby. However, he’s less intense than Calvin was, and we’re more experienced, so he’s easier for us. Julian would wake up for the day between 7:00-9:00am. I’d feed him when he woke up and then start down my to-do list until Julian was ready to nap. Usually I had time to eat before Julian had his first nap. Sometimes I showered. However, as soon as Julian napped, I religiously rested. I didn’t always sleep but I always laid down1. Then Julian would wake up, I would feed him, and we’d repeat until night time. Initially, it looked like Julian was going to sleep through the night2 quickly. However, Julian learned to wake up every 2-5 hours because the pediatricians told me I had to wake Julian up every 4-5 hours until he regained his birth weight. I planned on twelve weeks of maternity leave. I was very fortunate to have enough sick/vacation combo that I could cover it all at 100% of my normal pay3. 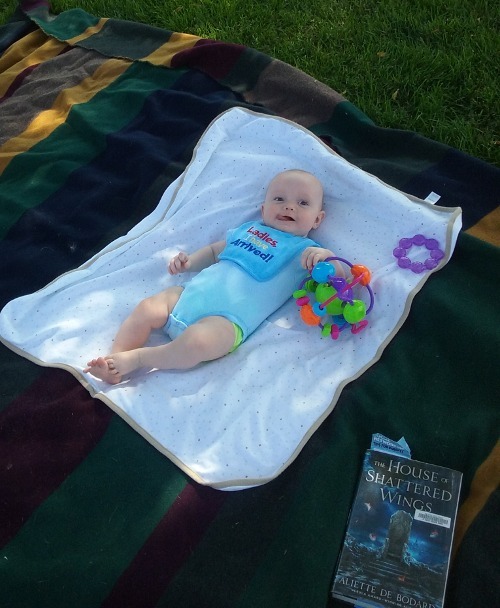 At four weeks postpartum everything seemed incredibly easy and I was getting bored. I took the opportunity to catch up on all my work email and started wondering if I could go back to work early. Then, all of a sudden, Julian started screaming unconsolably most evenings for an hour or so. Other things must have changed also, though I can’t put my finger on anything in particular, and all of a sudden I did not have the time or energy to go back to work early. The screaming tapered down a bit around six weeks but Julian was still on the fussy side. At Julian’s two-month appointment I learned that he had a milk protein allergy. This meant we got to switch from regular formula to expensive formula. I’m not sure if Julian’s fussiness was related to the milk protein allergy or not. I didn’t see an instant improvement when we switched formulas. However, Julian hated the formula and possibly wasn’t drinking as much as he really needed. At around 3 1/2 months we switched to a different hypoallergenic formula which Julian obviously preferred and his intake doubled overnight. At the beginning of June Calvin, Julian, and I flew to Washington state to visit my parents. Jaeger and I believe that one reason Calvin is such a good flier is because we started him early. So, of course, it was important to start Julian early also. I create all our packing lists on our personal wiki and so I was able to pull up my packing list from when Calvin was the same age. I was astonished to see that at the same age Calvin had been drinking six ounces of formula while Julian was only drinking two. This wasn’t because I was making more breastmilk this time, Julian was just eating less food. We left for the airport with plenty of time and breezed through security only to learn that our flight was delayed. One of the flight attendants gave Julian a first flight certificate. The flight went well other than our plane being delayed and Calvin and I having a disagreement over whether our supper had been lunch. Julian slept most of it and I don’t think he cried at all once we were on the plane. We got to my parents’ house a bit after midnight and I was horrified to discover that the first couple clothing layers in our luggage were soaking wet. This included Julian’s sleep sack. I’ve had planes delayed by weather before and sometimes the outside of the luggage has been damp but never the inside. Fortunately, the baby monitor survived unscathed4. A couple of days after we arrived my parents took us to the beach for several days. Calvin had a lot of fun but I mostly stayed inside the rented house because Julian did not approve of the wind. Still, I find coasts on the northwest very invigorating. The following Monday I started work. We were going to have an au pair come from China to watch Julian but she wasn’t scheduled to arrived till late July so Jaeger’s mom watched Julian. I was really excited to get back to work but also nervous. I was worried because I had a hard time after Calvin was born being productive at work. I think it was different this time because 1) I was getting more sleep 2) I didn’t have to rush Julian to daycare before I could work and 3) I worked in the morning instead of the afternoon. At about 3 1/2 months my mom came out to watch Julian. Julian continued to reject the first hypoallergenic formula. In fact, it had gotten worse since I started working because he started getting some breastmilk in a bottle. Easy delivery plus better taste must have made him decide he had no need for the icky formula. I was at my wits end because I wasn’t producing nearly enough to exclusively feed him breastmilk and Julian was getting crankier. I called the doctor’s office and they suggested I try a different hypoallergenic formula. I was dubious because it seemed, on the internet, that everyone preferred his first formula. However, Julian definitely preferred the second formula over the first. In fact, all the adults also agreed the second formula tasted better (yes, I tasted it, I wanted to know what I was giving him). Immediately Julian doubled his formula intake. I hadn’t realized until that point how much his feeding had been stressing me out. I was emotionally so much better than I had been with Calvin that I hadn’t really noticed the stress points that still existed. Breastfeeding had been getting progressively harder. It had gotten to the point where Julian would only eat well at night when he wasn’t very awake. Since I now felt Julian was getting enough food from formula, I decided it was time to start cutting down on the breastfeeding. I did it very slowly as when I stopped pumping for Calvin I got mastitis. This time I was much more careful. Eventually I was down to only a couple of times a night, mainly as an enhanced pacifier, while we waited for the formula to warm up5. Also at about 3 1/2 mounths Julian’s sleep deterioted noticably. He was having a very hard time napping during the day and also started waking up every 2-3 hours to feed. I was hoping that getting adequate amounts of food would allow him to start sleeping through the night. Calvin was sleeping through the night, a solid 8+ hours, by 3 months. However, more food didn’t seem to increase Julian’s night-time sleeping. Julian is now back to sleeping every 3-4 hours, which is a great improvement, but not where I’d like him to be yet. Julian usually eats every 3-4 hours during the day and sleeps every 2-3 hours (though anywhere from 1/2 hour to 2 hours, usually on the shorter side). As long as I fall asleep by 9pm every night I usually get enough sleep. Naturally, Julian’s worst night are usually correlated with me cheating and going to bed late. Our Chinese au pair was suppose to arrive at the end of July but two days before she was suppose to leave China we got a message that she had fainted and was having major surgery at the hospital. She wasn’t going to be able to come on time. Jaeger and I discussed it and decided that a recovery for that major of a situation probably meant that we needed to go ahead and find another au pair immediately. Jaeger’s mother was having surgery on her hand and would be unable to take care of Julian past the original dates we had agreed upon. Some frantic searching passed and we found an au pair that needed to transition from her initial host family due to personality and lifestyle differences (she’s vegan). We looked at her profile and thought she looked like she’d work out. She’s now been with us for about a month and so far it has worked out very well. She’s very good with Julian, which was my number one requirement, and being vegan her diet is also compatible with ours. Next week Calvin will start 1st grade which will add different complications to our schedule. I think he’s also going to be joining cub scouts because one of his good friends will be in it so that too will be a new experience for us. Speaking of Calvin . . . Calvin is doing incredibly well with Julian. Sometimes when Julian is screaming, and I’m not immediately available, Calvin will try to put the pacifier in or hand him a toy to play with. I decided not to put Calvin in any summer camp or daycare. I had some idea of making him read to me every day as well as doing a bit of math. That fell through once I went back to work. Calvin has spent most of the summer listening to audiobooks while playing with Legos. Right now he’s listening to The Odyssey6. I’m sure this books is too mature for him. However, I was so tired of loading multiple books every single day. At least The Odyssey is long enough he’s been listening to it for multiple days7. I do try to push him outside at least once a day and he does enjoy playing in the sandbox and watering everything but the plants. Summer hasn’t been a particularly stimulating experience for him. However, I think this may actually be a good thing because he’s looking forward to starting school. This would be a major advantage over last year when he went from a play-based preschool to a more classical oriented and traditionally structured kindergarten. My biggest aggravation at the moment is my lack of reading time. I’ve listened to a ton of books but have read less than five since Julian was born. I love listening to audiobooks but it’s a different experience than reading them8. I have finished two books in the last week so maybe I’m slowly ramping up again. All things considered, I don’t find the second infant experience nearly as demoralizing as the first. It helps that I can look at Calvin and know that some day Julian will sleep through the night and I won’t have to choose between reading and sleeping. This entry was posted in Calvin, Julian, Parenting on August 23, 2015 by kiesa. Crestview Park suffered damage during the 2013 flood. 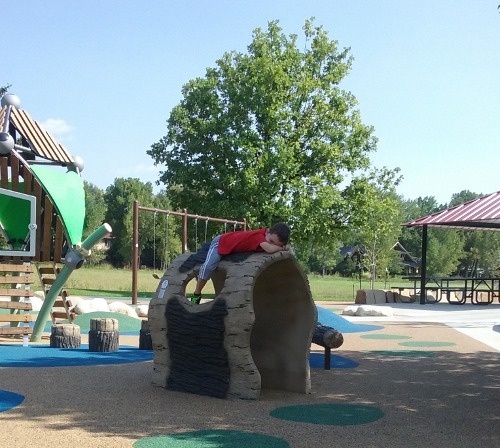 The renovations were completed just this summer and the playground looks new and shiny. 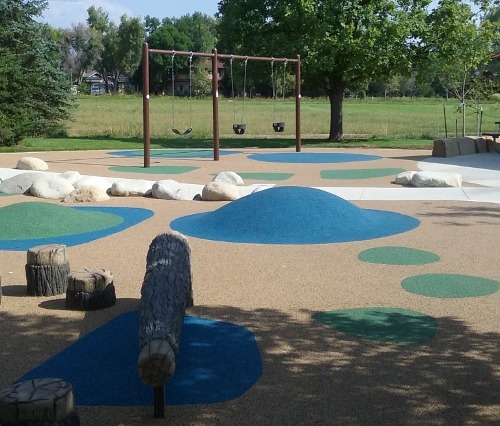 It’s a short walk from street parking to the playground structure. 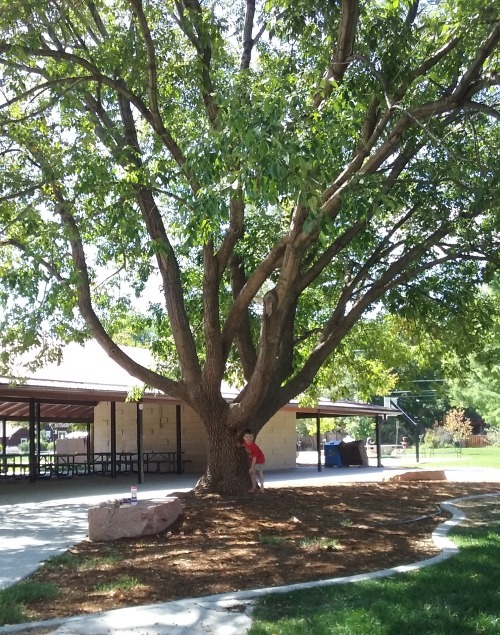 The original park trees are still there and provide several shady areas for sitting. While Calvin played Julian and I relaxed under one of the trees. 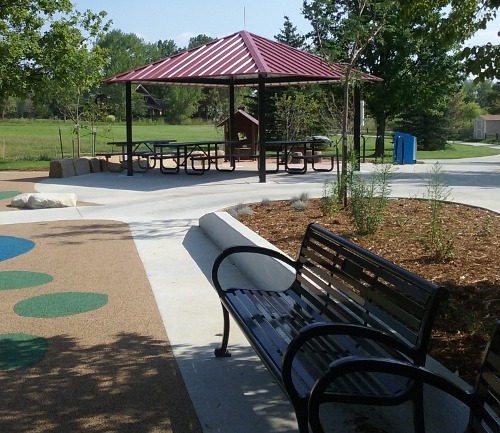 There’s also several benches and a shaded picnic shelter. 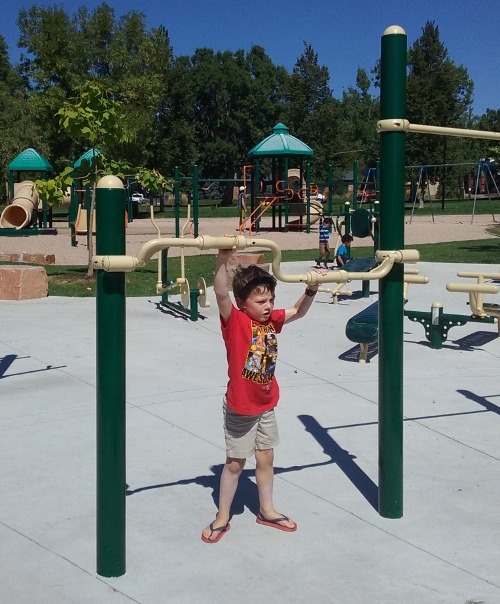 The playground isn’t large but it has a nice combination of equipment. 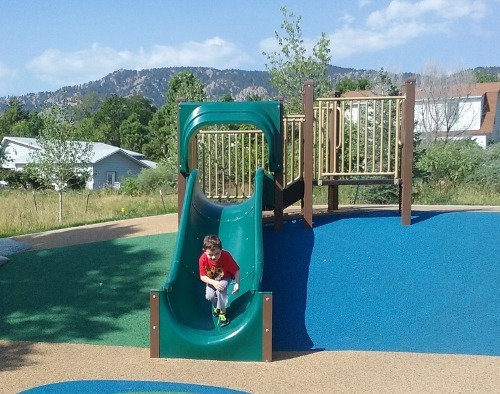 It has a basic slide that is built on a small slope. There’s a bridge from nowhere. From the bridge you can step on stones, then navigate a net which leads to a house play structure. Calvin decided he wanted to pose in the little house. But did walk over and examine the sand pit, play house, and “wood” table and chairs. Unfortunately, I didn’t think to include our sand toys. No one was there when we first arrived at the park so Calvin wandered around for a bit before laying out on the “log” and complaining there was no one to play with. Fortunately, a couple of kids arrived after that and we stayed until Julian started to get fussy. Shade Shade trees and shelter. There is some shade on parts of the playground. However, there is quite a bit of shade off to the side of the play area. Picnic area Yes, covered shelter with three picnic tables. Parking Street parking, requires short walk to playground. 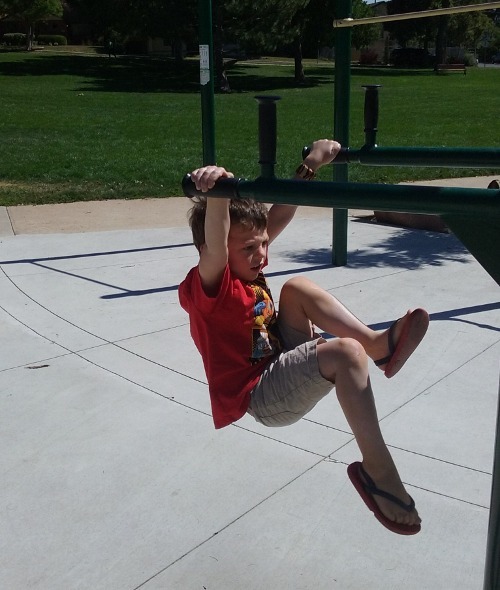 This entry was posted in Parenting, Parks and Playgrounds on August 23, 2015 by kiesa.